If you’ve been reading here for any length of time, you know I am passionate about mothering. Whether it’s a biological child, adopted child or simply sharing LIFE by mentoring another in ones life, the opportunity to impact and influence in all sorts of forms is a gift. Here’s a portion of my previously published story. Terrified and torn, a young woman girl, seventeen, sacrificed so that her firstborn could have life. For nine months, perfect innocence was knit together in her womb. Yet on a blistery Milwaukee March day, she made a choice. A choice of sacrifice. A choice of redemption. A choice of hope. Decades later, as a mother of five, I sit at my computer pondering just what that decision means. I am the result of her choice, her sacrifice, her hope of a better life for a daughter. Her decision that day has already impacted generations. I can’t imagine what it would be like to never know one’s firstborn. As I reminisce on my first moments as a mother, the thought of transferring that holy time to another breaks my heart in two. Yet, her decision to give me up for adoption, was one of the greatest gifts I have ever received. As her heart shattered, mine formed. How can such an ironic dichotomy exist? Psalms 139:13 declares that I was knit together in my mother’s womb, but I firmly believe that the Lord saved the last stitching until six weeks after my birth when the final bonding was ultimately done with my forever family. Honestly, I have never searched for my birth mother, nor felt that I was missing out on a precious part of my life. The “incomplete” feeling that so many adopted children wrestle with has never resonated with me. But when our second son was born with a congenital birth disease, the “need to know” surfaced on a medical level. So many questions were asked with which I didn’t have the answers, and I started pondering things on a logistical level, not an emotional one. As I was bombarded with questions, it was the first time I truly started wondering about this woman who bore me years ago. Adopted into my forever family as a newborn, I’ve been encompassed with strength, commitment and grace from a generational legacy of love. The blessing who rocked me, fed me, nurtured me and continues to guide me to this day is my forever mom; a woman who continually defines motherhood in unconditional ways that I can only imagine. Growing up in a home where the door was opened to many unwed mothers during their pregnancies, I constantly heard their heart. Could it be possible that the woman who gave me life has voiced those very same thoughts for decades? Does she wonder what has happened to her firstborn? Does she still hope she made the right decision? Her unselfish sacrifice, at just seventeen years old, opened the door so that I might know from where my Ultimate Hope resides. Does she know you? Does she have the same hope? I want her to know you, my Jesus – the Redeemer of our past mistakes and the hope for our future. And so I ‘wait for the blessed hope – the glorious appearing of our great God and Savior, Jesus Christ,’ (Titus 2:13) and I pray that when that day comes, that she will be there – the woman who gave me life. If that opportunity arises to meet her, it’s not out of a sense of loneliness or lack of completion, but out of gratitude. My heart overflows with gratitude for her choice. Your post was beautiful. We adopted our first as an infant. His mother also made the most amazing sacrifice!! We are fortunate to still have contact with her and are thankful every day for her precious gift…our son! This post warmed my heart. As you know, we adopted our first and I often wonder about her birth mother. Sadly, her situation is not a positive one but she did make that same, most courageous decision and I will forever tell my daughter about her courage and love. I love your blog and the beliefs you stand up for. We have 2 bio kids and 3 adopted. Unfortunately our adoption story is heartbreaking. The only really unselfish thing their birth mom did was give birth to each one instead of aborting. But she introduced them to a world of fear, insecurity, trauma, sexual abuse as well as drug abuse. None of my 3 are healed yet. After parenting them for 10 years and years of therapy with a Godly Christian therapist, they still struggle with enormous questions that can only be answered with their relationship with God. I am so happy to hear of one story that has had a blessed beginning, middle and one day end. I cling to the hope that my children will one day have theirs. Your post is heartwarming. We adopted both of ours girls when they were babies. What a hard thing to do as a birth mother but I thank them every day because without them I would never have became a mother. I hope in their hearts they know they did the right thing because both girls are growing up to be wonderful woman!!! You are so precious. Your comments in “Thank you…for your choice” brought me to tears. I am a birth mother who has been reunited with the son I placed for adoption 31 years ago. He felt just like you…always wanted to meet me and to let me know how much he loved me and thanked me for the choice I made when I was 19. When you said, “As her heart shattered, mine formed. How can such an ironic dichotomy exist?” I completely understood. The agony of releasing your own child into the arms of another is something words can’t describe. You know it’s the right thing to do for both of you, but it tears at the very heart of the birthmother. I’m so glad to hear such a beautiful and possitive story and I’m grateful you shared your heart with us. As an adopted child, this post REALLY spoke to me. I too, was adopted into my Forever Family and constantly wonder where my biological mother found the courage to give me up. I know very little over her, except that she was still in high school. I am SO thankful that she was able to make this decision knowing the hard road we both would have faced if she had tried to raise me herself. My hope, like yours, is to someday find her and tell her how thankful I am and to share all that I’ve accomplished. I feel that she deserves to know that her sacrifice was well worth it for her child and the family that raised me. Again, thank YOU for this wonderful post! Wonderful! My youngest son is adopted and though I will probably never meet his birth mother, she has given me a precious gift. Thanks for writing about such a worthwhile topic! Jen, your post makes me cry. Thank you for sharing it. thanks, my friend…I guess we you leaving we can’t get together. Bummed but so thrilled for your big surprise. I’m glad I saw your tweet about Melissa’s post. With Tasty Tuesday, I always forget to link up for yours (even though yours is my fav. :)) I did add a link back, but my computer keeps freezing and you may have popped by when it was in limbo waiting to repost. I love your passion… this was great to read! She truly did sacrifice and God brought unimaginable good out of it! I love hearing your story and your heart for helping reunite birth moms with their children. Thank you for sharing! Jen, thank you so much for sharing this story! My sister adopted her oldest son and he just turned 18 and is a BLESSING to our family! Your post moved me to tears and joy! What a wonderful life story you have! And your mother is a beautiful person! Jen…this is amazing. I am sharing this with my girlfriend who has really struggled with her past decisions. I love this. Thank you. Your words are beautiful for the woman who physically brought you into the world and the woman who brought you up in it. Oh sweet sister in Christ, what a testimony and prayer for your biological mom. I know why I’m drawn to your sense of passion. I’m also adopted and wondered, longed, prayed, cried over my biological mom as well. It’s something that will never let go. You’ve put it so eloquently in this post. God bless you for sharing your heart. Your story is one of gratitude and hope. Thank you so much for sharing it as it is very encouraging. Thank you so much for sharing, Cherry. I guess I don’t write about it often because I forget I am adopted. Isn’t that a beautiful miracle. the Lord has so knit me perfectly with my family that it’s not an issue I wrestle one. Just one of extreme gratitude. What a beautiful story. I too am an adoptee and I am grateful to hear such loving tributes to the moms who sacrificed their heart for their child. Sadly, I am in a failed reunion myself and had lots of anger toward everyone when I found my first mother. Honestly, before searching I thought of her but never thought I was missing anything. Then I heard her voice and lots of feelings overwhelmed me. Love, sadness, anger, hurt and loss. I think we both had many issues we didn’t resolve, her, losing her child and me losing my mother and that primal need for her. I continued to have such anger at anything adoption. Now, I can see through that sadness, and count my blessings. I loved my mother (adopted mom) who has passed on. I miss her, and maybe I wanted my first mom to fill that void..which can’t happen. Thanks for your post. What a beautiful perspective. My older sister is adopted and I could not imagine my life without her. I thank God that her birth mother gave her to us. Love this, friend! Love you! Love this post and I echo so many of your words for my son. We adopted him at birth and as he turns 3 next week, I have been thinking a lot about his birth mother and the incredible sacrifice that she made at barely 15 years old. I praise God that we have an open relationship with her and her extended family and pray that the door always remains open if and when my son wants to go there with her. I love how the Lord makes things so right, even though they often seem to start out so wrong. Thank you for sharing your story! Becca – thank you for sharing your story and welcoming him into your family. As the adopted, never once have I ever felt “Second class” or missing out on something because I was adopted and I’m sure your precious son will feel the same way. I was adopted by such an amazing family, that I’m continually thankful for the the Lord’s hands all over the adoption. Pass the tissues! Jen, this is so beautiful! I applaud you for sharing your story. 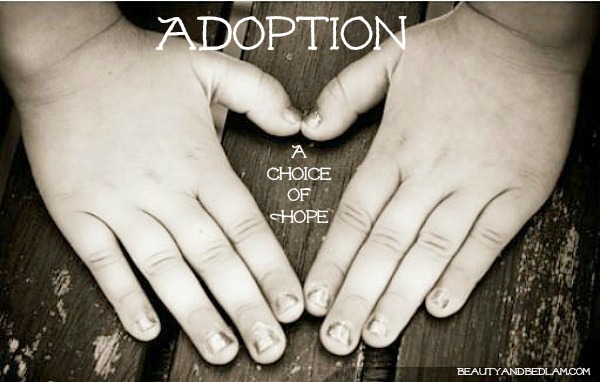 I wish more people were familiar with the adoption option. So many unwed mothers now either turn to abortion or keeping the baby, which makes for a difficult life for all involved. I too am adopted & forever thankful to my birth mother for giving me up to have a chance at a better life. My story is very much like yours. I also have some of Linda’s story. When I turned 21, I initiated the search for my birth mother. She is a fine woman but her family & subsequent children have made choices that are hard for me to accept. I’ve had to sever my ties with her to keep my own sanity. It was nice to know some things & find out medical information, but has turned out to be more heartache.